German rabbi; born in Murowana-Goslin, Posen, 1811; died in Oppeln, Prussian Silesia, Aug. 25, 1895. Having acquired his diploma as Ph.D., he went as rabbi to Posen, where he introduced a modern synagogal service with German sermons. He met, however, strong opposition, headed by Solomon Eger; and the services could take place only under police protection. 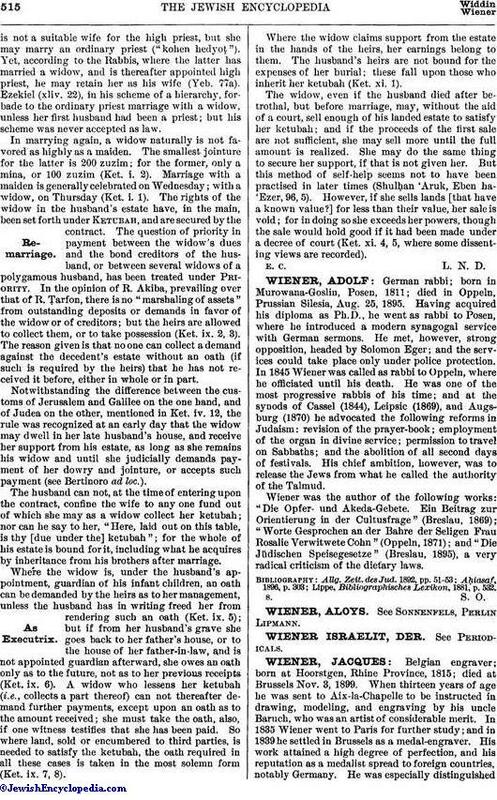 In 1845 Wiener was called as rabbi to Oppeln, where he officiated until his death. He was one of the most progressive rabbis of his time; and at the synods of Cassel (1844), Leipsic (1869), and Augsburg (1870) he advocated the following reforms in Judaism: revision of the prayer-book; employment of the organ in divine service; permission to travel on Sabbaths; and the abolition of all second days of festivals. His chief ambition, however, was to release the Jews from what he called the authority of the Talmud. Wiener was the author of the following works: "Die Opfer- und Akeda-Gebete. Ein Beitrag zur Orientierung in der Cultusfrage" (Breslau, 1869); "Worte Gesprochen an der Bahre der Seligen Frau Rosalie Verwitwete Cohn" (Oppeln, 1871); and "Die Jüdischen Speisegesetze" (Breslau, 1895), a very radical criticism of the dietary laws. Lippe, Bibliographisches Lexikon, 1881, p. 532.